Well keeping warm is not something that is bothering these dogs. 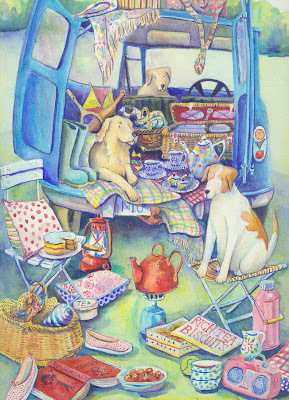 The sun is shining and what better time to head out for a drive down country lanes and find a suitable spot for a picnic. I think they might be by a meadow, next to a river, with the reeds gently swaying in the wind and the water racing past. They might dip their hot little paws in too cool of after their game of cricket and then make it back to the car for one last cup of tea before heading home. This seems a distance summer memory in more ways than one, for all its busyness and eventfulness. I started the 'minivan picnic' painting in June when I found myself sitting next to K's boat in the middle of a concrete jungle. But sitting beside me was the most perfect Minivan. It was such a helpful little car, I had no camera with me and it posed for me just the way I wanted it too, opening and shutting its doors trying to find its most flattering view. 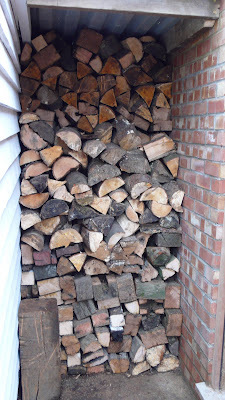 We have built a new wood store and with some much appreciated help all our wood is chopped up ready and waiting. With any luck it should be enough to last the winter out. I tend to rely on the wood burner to keep the house warm and cosy in the evenings, its amazing how the warm air rises filling the house. There is something so very satisfying about stacking logs and something very compforting about seeing a stacked pile of logs. The chimney has had its yearly sweeping and the wood burner is all ready and waiting to be lit. I am very lucky to have the luxury of the rayburn. We have brought in the winters supply of oil. This time because of the price we only brought in 500 litres, I find it very funny with oil waiting for the price to be ok but if you run out and then you are just forced into buying at a high price. I have found a lovely new oil engineer who will look at my rayburn when it misbehaves, (like blowing the hotplate up...that sounds more dramatic than it was!!!). If anyone needs a rayburn engineer in sussex I would love to recommend him and pass on his details. We have been trying to think of ways of making it work more efficiently. Which meant a weekend with all the floor boards up. K put his plumbers hat on and replaced all the pipe work from the rayburn to the hot water tank to the radiators with larger pipes to pump the water quicker into the system. He did a fantastic job and when we refilled the system there was not one leak. K also fitted me a radiator in my work room. Last winter I managed with out, as I said the wood burner does a good job of heating the house and I'm all for putting more jumpers and hats on. The winter before, my work room was lovely and warm, as I had the chimney from the solid fuel rayburn, which warmed up and made the room all cosy. The oil rayburn required a chimney liner and so no longer does the chimney warm up. We have also been lagging any pipes in the airing cupboard, which has made more difference than I could possible imagine. The only problem is the airing cupboard is not so warm, not really a problem as it was never big enough to do any airing in. Captain Rupert is rather amused with all these going on. He says whats wrong with a good old fur coat, is has grown silky soft and thick for the winter. He shakes his ears and twists his tail of he hops down the garden path, out in the wind, out in the rain and out in the cold. As the cold does not bother a brave little rabbit with his handsome fur coat. And fallen leaves are so crunchy to play in and soo very tasty to eat. Well I'm not too sure if thats true as in the evening before rabbit bed times, There are some little ears waiting by the door, I let him in and wipes his muddy paws on the door mat, leaving little rabbit paw prints. 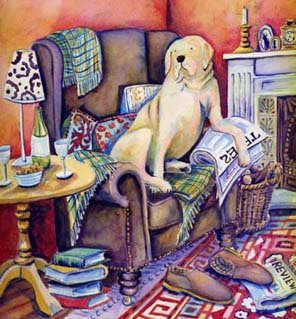 And off he hops to the fire and enjoys his toast and evening tipple, dreaming of dry grass under paw and long days stretched out under the hedge enjoying the sunshine.